Winter birds suffer from high mortality when the temperatures turn colder, but providing effective shelters can help them survive even the coldest nights or most vicious storms. While birds do have many ways to keep warm in winter, the freezing rain, wind chill and deep snow of the season can easily be fatal if birds don't have at least minimal protection. Unfortunately, just at the time when the birds need extra shelter, deciduous trees are losing their leaves and providing less protection not only from the elements but also from winter's hungry predators. Backyard birders can help their flocks, however, by providing adequate winter shelter. There are many ways to provide safe shelter for winter birds, and providing that shelter and protection will help attract more birds to a winter backyard. Evergreen Landscaping: Planting trees and bushes that keep their cover throughout the year is an easy and natural way to provide birds with winter shelter. Many of these plants will also provide seeds, nuts or berries that can be a natural food source for wintering birds, making them even more valuable in bird-friendly winter landscaping. To be most effective, evergreen landscaping should include trees, shrubs and dense groundcovers to provide shelter at all levels birds may use. Brush Pile: Building a brush pile is a fast way to provide winter shelter for a variety of birds. Use both large and small branches to form the bulk of the brush pile with plenty of air spaces for roosting and insulation, and include evergreen boughs for extra shelter and protection. Positioning the pile in a sheltered location where it is protected from the strongest winter winds and drifting snow will make it even more attractive to birds. Roost Boxes: Specialized bird roost boxes provide secure, comfortable shelter for different types of small birds. These boxes have unique adaptations that make them ideal for winter shelter because they will hold heat more effectively and can shelter multiple birds at once. Roost boxes can be purchased from many wild bird supply stores or made easily from scratch. Winter Bird Houses: If roost boxes are not available, backyard birders can leave up birdhouses through the winter as a shelter for roosting birds. While a birdhouse will not be as effective for winter shelter as a specialized box, it is far better than no shelter at all. 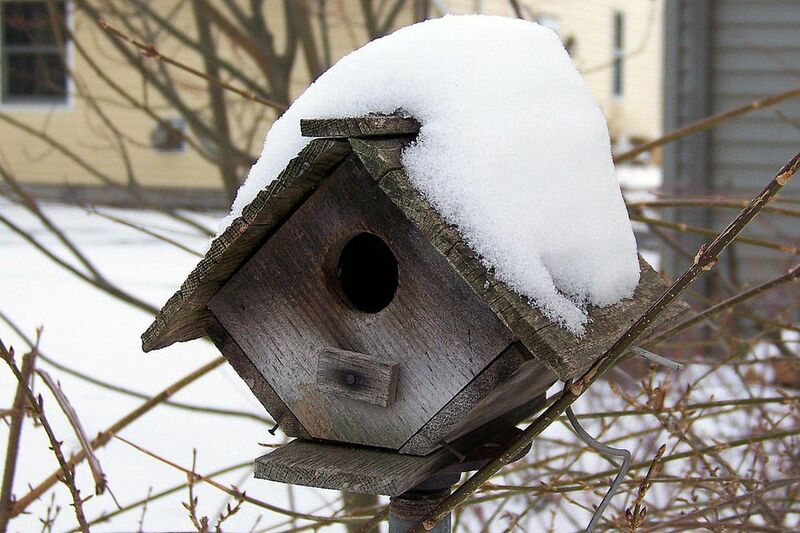 It is also easy to winterize a birdhouse to turn it into a safer and more comfortable winter shelter. Roost Pockets: Basket-style roosting pockets are inexpensive and can be very cozy winter shelters for small birds. These pockets are typically made from woven thatch material such as straw, hay or wicker and despite their delicate appearance can actually be superbly insulated for winter birds. Adding a layer of wood chips to the interior of the pocket can help it be even more comfortable and warmer in winter weather. Ideally, the most bird-friendly yard will provide several types of winter bird shelters so a large number of birds can be securely protected during cold weather and winter storms. Regardless of the type of shelter offered for winter birds, there are ways to make it even safer, more effective and more attractive to chilly birds. Position shelters facing south to take the most advantage of passive solar heating from the winter sun, but be sure there are no strong winds that will blow into the shelter's entrance. Paint roost boxes or birdhouses dark colors to absorb the most heat. Neutral tones such as dark greens, grays or browns also help camouflage the house so it is not as visible to predators. Protect shelters from predators by removing perches and placing boxes or houses in isolated, safe areas. Use baffles if necessary to keep predators from climbing posts or poles. Position brush piles, roost boxes and winter birdhouses in areas sheltered from the wind and the heaviest snowfalls, such as in a fence corner, alongside a shed or under eaves. Provide insulating material in winter birdhouses and other shelters. Wood chips, dry grass or nesting materials can plug cracks and holes so birds will retain body heat more efficiently. Prune landscaping in the spring rather than the fall so birds can take advantage of extra insulating spaces and natural cover throughout the winter. With proper shelter for backyard birds, it is possible to overcome the cold winds, icy rain and snow that claim many birds' lives in the winter months. By providing suitable shelter and protecting it adequately, birders will enjoy a warm and happy backyard flock all winter long.